US President Donald Trump's daughter Ivanka and her husband, Jared Kushner, have arrived in Israel ahead of the opening of the new US embassy in Jerusalem on Monday. The couple - both senior White House advisers - will attend the ceremony. Mr Trump himself will not be there. His decision to move operations from Tel Aviv angered Palestinians. The plan was brought forward to coincide with the state of Israel's 70th anniversary. Israel regards Jerusalem as its "eternal and undivided" capital, while the Palestinians claim East Jerusalem - occupied by Israel in the 1967 Middle East war - as the capital of a future state. Mr Trump's decision to recognise Jerusalem as Israel's capital broke with decades of US neutrality on the issue and put it out of step with most of the international community. Why do evangelicals support Trump on Jerusalem? Israeli Prime Minister Benjamin Netanyahu said the embassy move was a reason for celebration and called on other nations to follow suit. "I call on all countries to join the US in moving their embassies to Jerusalem," Mr Netanyahu said, adding: "It's the right thing to do... because it advances peace." Palestinian Authority President Mahmoud Abbas has described Mr Trump's decision to move the embassy as the "slap of the century". A small interim embassy will open inside the existing US consulate building in Jerusalem on Monday, while a larger site will be found later when the rest of the embassy moves from Tel Aviv. President Trump is expected to address attendees at Monday's event via video link. US Treasury Secretary Steven Mnuchin and US Deputy Secretary of State John Sullivan will be there in person, alongside Ivanka Trump and Jared Kushner. Mr Kushner is set to meet Israel's prime minister on Sunday afternoon, according to the local press. The European Union has voiced strong objections to the embassy move, and most EU ambassadors in Israel will be boycotting the event. However, dozens of other foreign diplomats are expected, including representatives from Hungary, Romania and the Czech Republic - countries which reportedly blocked a joint EU statement on the issue. The presidents of Guatemala and Paraguay are also set to attend; both countries decided to move their embassies to Jerusalem after Mr Trump made his announcement. Why is the move so controversial? 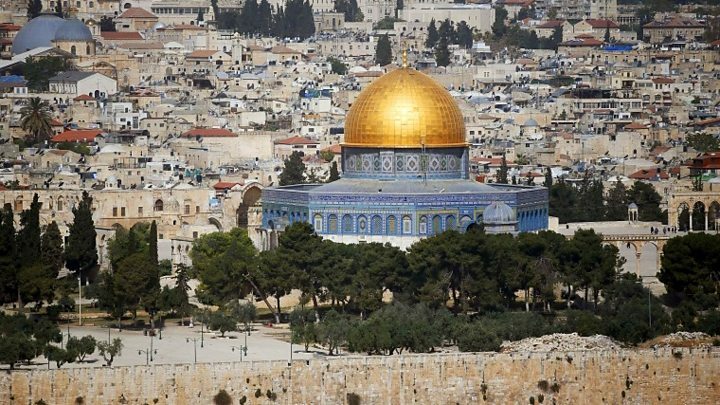 Israeli sovereignty over Jerusalem is not recognised internationally and, according to the 1993 Israel-Palestinian peace accords, the final status of Jerusalem is meant to be discussed in the latter stages of peace talks. Since 1967, Israel has built a dozen settlements, home to about 200,000 Jews, in East Jerusalem. These are considered illegal under international law, although Israel disputes this. Various countries once had embassies based in Jerusalem but many moved after a 1980 law saw the country explicitly claim the city's east, despite UN objections. Why is the situation so tense? The timing of the embassy move has led to concerns about increased tension in Gaza. Since the end of March, more than 40 Palestinians have been killed in protests at the border. The day after Israel marks its anniversary, Palestinians commemorate what they refer to as the Nakba or Catastrophe, when hundreds of thousands of their people fled their homes or were displaced following the foundation of the Israeli state in 1948. Organisers call the rolling protests the Great March of Return, which is set to culminate on Tuesday. UN human rights chief Zeid Ra'ad al-Hussein accused Israel of using "excessive force". Israel maintains it has acted legitimately to protect its civilians from militants trying to breach the border. Why do US evangelicals support Trump's Jerusalem policy?